You don't need to be getting married aboard a ship or yacht to make the most of this popular trend. Destination weddings which are near the sea provide the perfect backdrop for this trending destination wedding color scheme. Whether you favor the color combos navy blue and white or want to add a flash of bright red, the nautical theme oozes class. 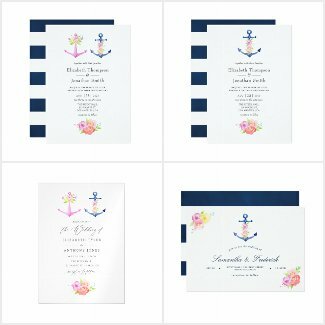 Also popular this wedding season are nautical invitations which feature floral decorated anchors and ships wheels. If this sounds too fussy for your tastes, there are the simple words of 'love' written with nautical rope for a modern, minimalist look. 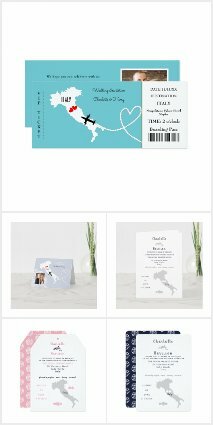 Have a look at the variety of nautical wedding invitations and matching stationery here along with my hand picked decorations and other goodies to create the 'stage' for your wedding ceremony and reception. Don't forget your nautical themed save the dates which are especially important for destination weddings as your guests will require more than the usual amount of notice. 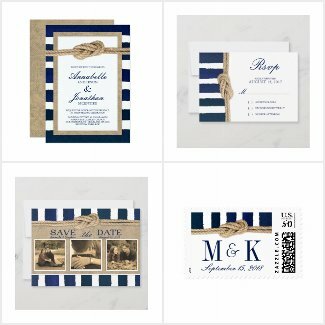 The designer says: The perfect Save the Date for a nautical themed wedding or event. 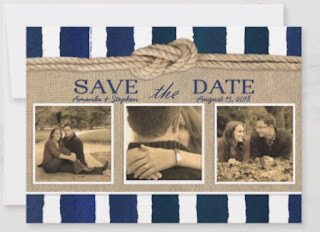 This product features a navy blue watercolor striped background with a rope tied in a nautical knot. Bordered with a burlap-look texture. The perfect blend of timeless nautical style and rustic modern accents. 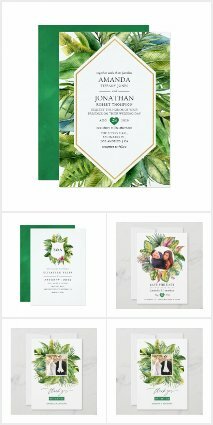 Add 3 of your own engagement photos to fully customize the card. 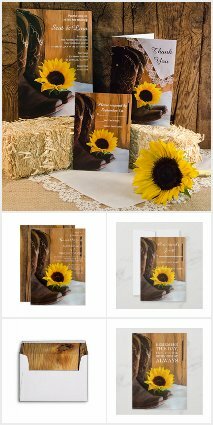 Square format photos work best with this product. The designer says: The perfect invitation for a nautical themed wedding or event. This product features a navy blue watercolor striped background with a rope tied in a nautical knot. Bordered with a burlap-look texture.The perfect blend of timeless nautical style and rustic modern accents. Your nautical wedding won't be complete without some elegant accessories and decorations. Have a look at these anchor, rope and sailing boat theme wedding items.